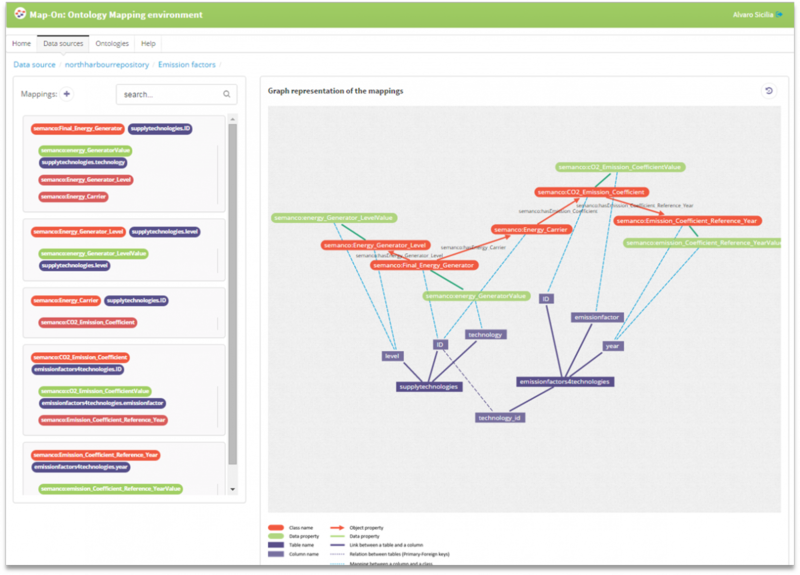 Map-On is a collaborative ontology mapping environment which supports different users –domain experts, data owners, and ontology engineers– to integrate data in a collaborative way using standard semantic technologies. 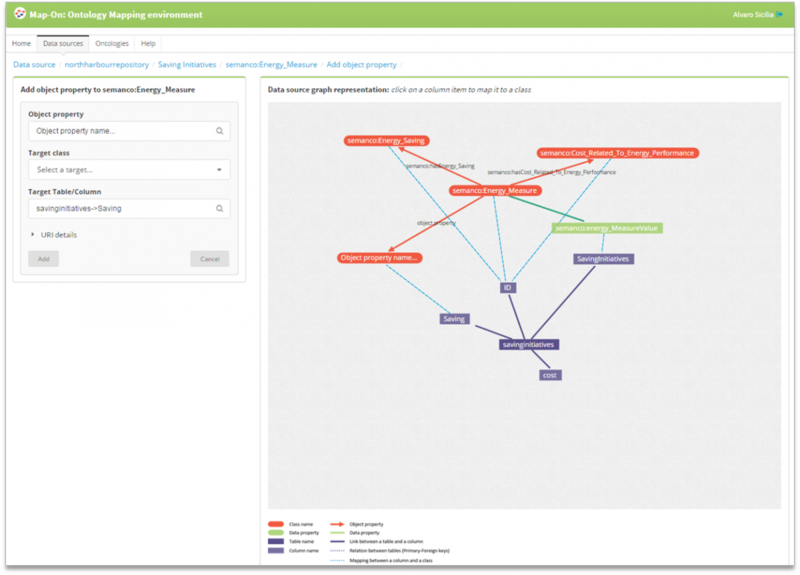 Map-On also automate parts of the mapping generation process in ontology-based data access (OBDA) scenarios. Loading multiple SQL database schema in the environment and their visual representation. Loading multiple ontologies, in particular those written in DL-LiteA formalism and their visual representation. Manual mapping the database to a domain ontology. The tool has been validated through their application in the data integration process of the Semanco project. However, the prototype tool is generic enough to be applied to other OBDA scenarios where R2RML mappings have to be generated by non-technical-skilled users and ontology engineers. In ODBA settings the data sources are accessed using a high-level conceptual representation without the need to know how the data sources are organized. The main components of an OBDA system are the ontology, which represents the conceptualization of the data sources’ domains, the mappings between the data sources and the ontology, and the query rewriter which receives queries in terms of the ontology to transform them in terms of the data sources. 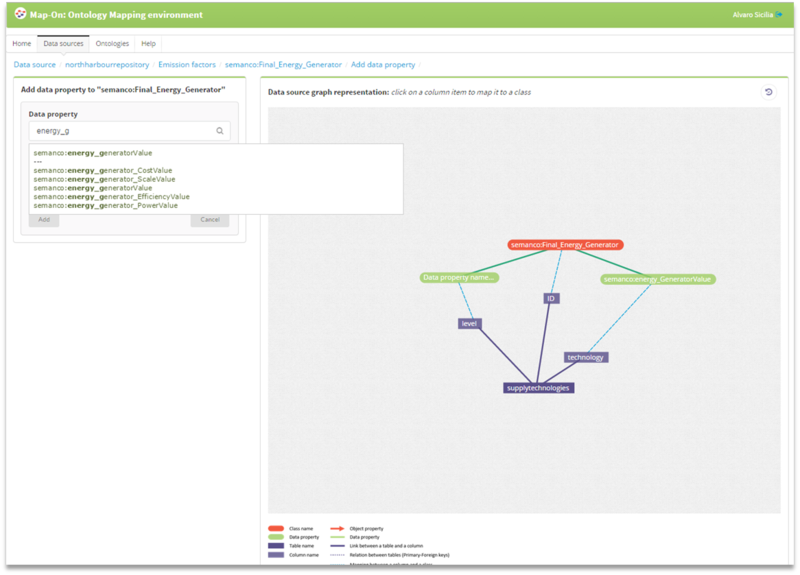 Map-On tool supports users to create the mappings between a database schema and a existing domain (target) ontology. 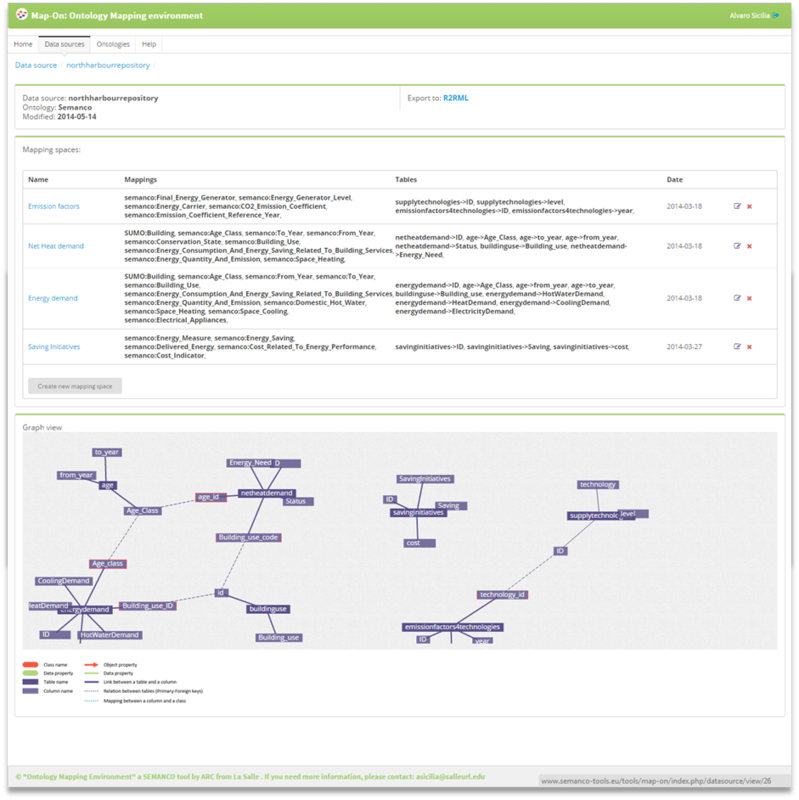 The tool provides visualizations of mappings based on a graph layout for the database schema and the ontology, an ontology mapping interface, and the automated generation of IRI patterns and SQL queries for the R2RML statements. The user can create new data sources uploading SQL files into Map-On tool. Thus the domain ontology –for mapping the data source– should be selected. The database schema is represented by means of graph structures. The mappings are organized by spaces, that is a mapping space will contains all the similar mappings such a partial view of the big picture. This way, users can isolate parts of the data source to reduce the complexity of the mapping creation. The mapping space is divided in two panels. In the right panel, there is the visualization of the mappings based on a graph representation. The user can modify the layout positioning the elements (i.e. tables, columns, classes, data properties) by dragging them. In the left panel, a list of mappings is displayed and the button for creating, editing and removing mappings. The first step for mapping a class and a element of the database schema is to select an appropriate class. The interface provides a suggestion list of possible classes while the user is typing the name. The second step is to select a column of a table, this can be carried out by selecting a node in the graph representation or typing in Table/Column source input box. The SQL query and URI patterns inputs are automatically generated, but the user can modify them. The object properties connect two classes. 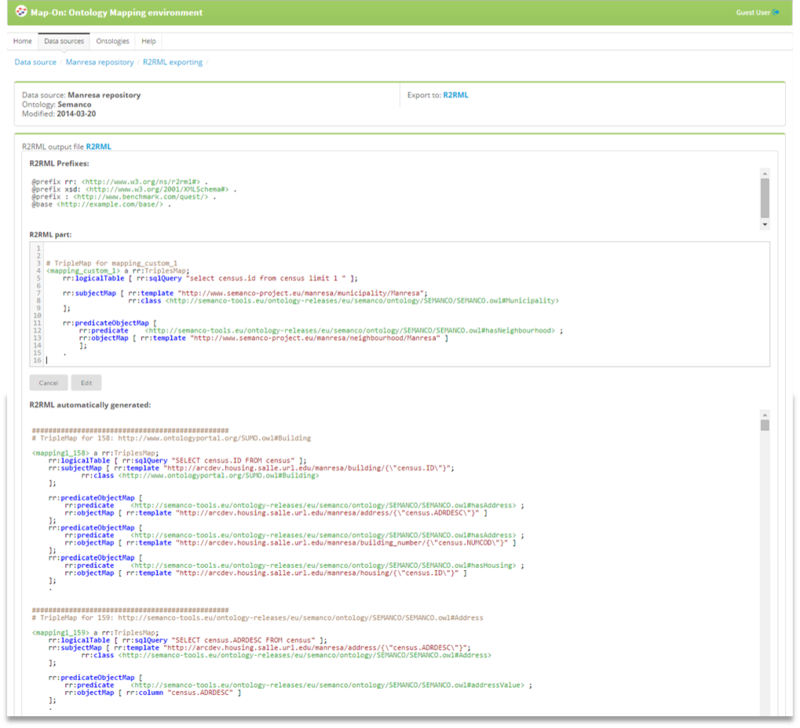 The user can select an object property to connect the domain (source) ontology (already mapped) with a range (target) class already mapped or create the mapping on-the-fly. In the second option, a column of a table has to be selected in the graph representation or typing in Table/Column source input box. When two classes mapped to different tables are connected the SQL query are automatically filled with JOINs clauses. The data properties connects a class with a literal. 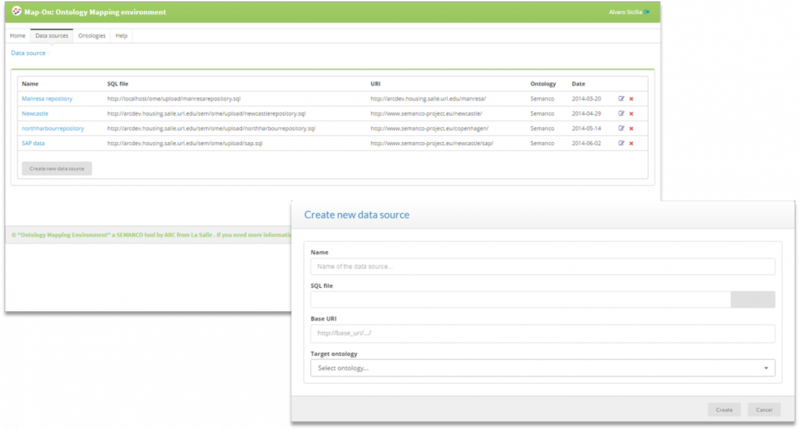 The user can select a data property from the ontology by typing the name in the input box. The column of a table can be selected in the graph representation or typing in Table/Column source input box. Users can create multiple mappings from a database element to different classes following a path whose origin is an existing mapped class. The user can expand the classes by clicking their nodes. For generating the path it is considered the object properties and the subsumption between classes. The environment automatically generates R2RML statements based on the configuration made in the graphical interface. The statements are TripleMaps where the logical table are defined by a SQL query. The IRI patterns are automatically generated based on the class name and the column of the table selected for each mapping. Map-On tool has been developed in PHP using the framework Code Igniter. 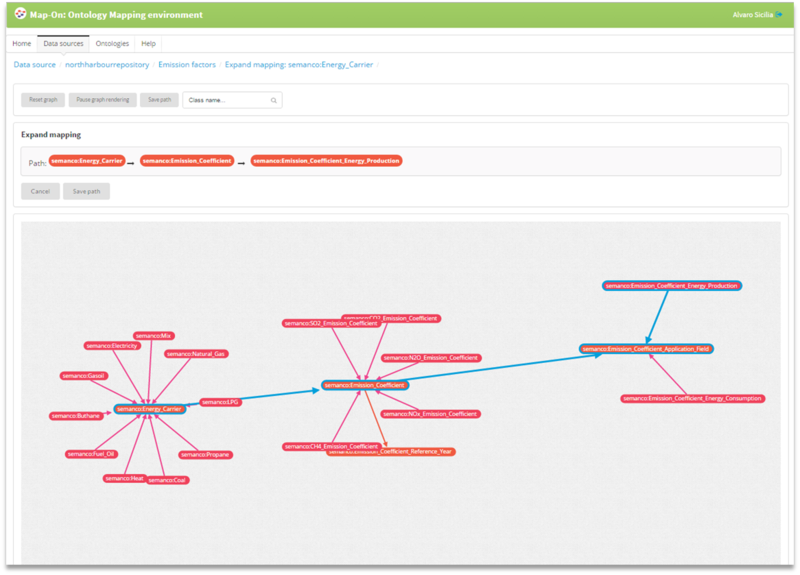 The graphical ontology representation has been implement using the VivaGraphJS library and ARC to parse RDF files. The mapping file generated is written in the R2RML Mapping Language. This document presents two tools developed to help different types of user involved in the ontology design -domain experts, data owners, and ontology engineers- to integrate data from multiple sources collaboratively using standard semantic technologies: an OWL mapping extractor and an ontology mapping collaborative web environment. These tools can be used: 1.To generate an OWL ontology from a schema database (almost all data sources exist as databases), 2.To translate relational data stored in tables and columns to RDF format according to the local ontology previously generated, and 3. To provide an environment where users can easily map a local ontology to a global ontology according to their knowledge. This paper presents Map-On, a web-based editor for visual ontology mapping developed at the Architecture, Representation and Computation research group of La Salle, Ramon Llull University. 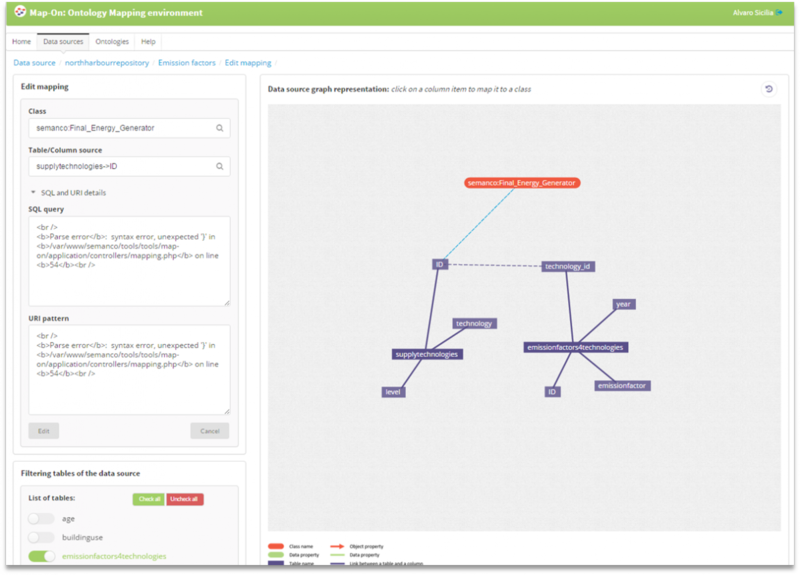 The Map-On editor provides a graphical environment for the ontology mapping creation using an interactive graph layout. A point-and-click interface simplifies the mapping creation process. The editor automatically generates a R2RML document based on user inputs, particularly producing IRI patterns and SQL queries. It has been used in real scenarios alleviating the effort of coding R2RML statements which is one of the main barriers for adopting R2RML in research and in the industry communities..